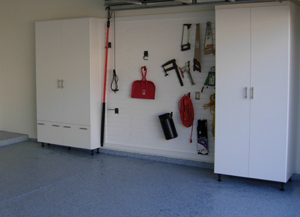 Before you move into your new home, check out the garage. Design your “car closet” so you can get into the car without the door hitting the the side of the garage. How is this done and still have storage? Slatwalls. Slatwalls allow vertical storage right against the walls. Organize.com offers many hooks from Schulte that hold tools, sports equipment, and gardening supplies. These fit on 3″ centers. Cabinets placed to either side of your vertical storage can contain those items you want out of sight. Now get out of the car without worries. This entry was posted in Garage and tagged auto, car, car closet, equipment, Garage, garage design, slatwalls on October 6, 2011 by Chris McKenry.